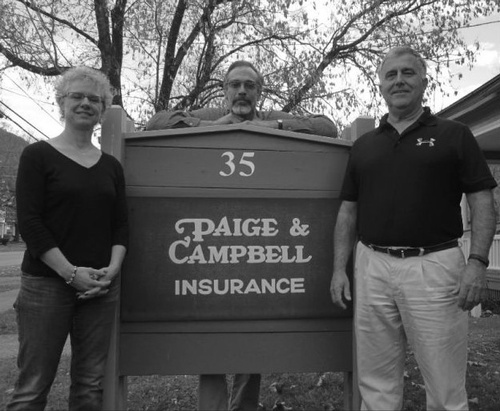 Paige & Campbell, Inc. is a full service independent insurance agency that has been providing insurance to Vermonters for over 100 years, with 25 employees and offices in Bristol, Barre, Bradford, and Waitsfield, Vermont. The agency offers all types of personal, business, life, health, and employee benefits insurance and financial services. Andrea Ryan joined Paige & Campbell in the summer of 2001. She is licensed to write personal lines home and auto insurance. Andrea can be reached at aryan@paigeandcampbell.com. Bill Bryden has been in the insurance business since 1987. Bill was instrumental in establishing the Bristol office; he specializes in personal lines coverage as well as works with area business owners. Bill can be reached at bbryden@paigeandcampbell.com.